Owning a motorcycle is as much about making a statement and being seen as it is about freedom on the open road. Everything about bikes is highly stylized, be it with bold colors and patterns, or just by the shape and design as a whole. When you’re out on your bike, you need all of your gear to function at a high level, helping to guarantee your safety in case a worst case scenario does happen. Clearly, safety comes first, there’s no question about that. However, once you’re sure that a piece of equipment is going to protect you as much as you need it to, then there’s nothing saying that you can’t also look good at the same time. In the world of motorcycle gear, the helmet is going to be one of the most prominent, and important, pieces of gear you can buy. With all the options out there, where do you even begin to look? Right here. This buying guide is going to take the best all-around selections from all of the categories, and bring it down to a handful of the top choices. This way, you can be sure that whichever direction you want to go in, you’ll be well-taken care of in every way. To choose the perfect one for you, it’s all going to come down to how you want to ride. Maybe you like to have the wind in your face at all time, enjoying everything the road has to offer. Or, you could be a more intense rider, wanting to block out all distractions so you can focus on the only thing that matters: the ride itself. 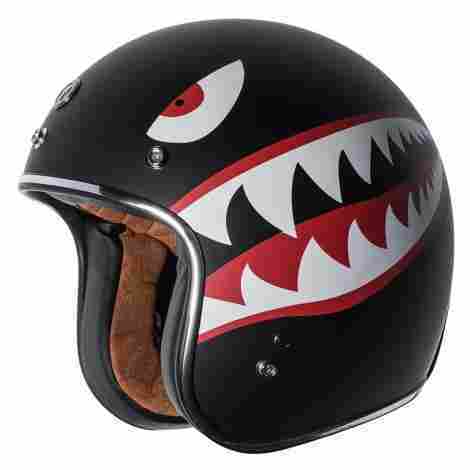 We’re starting this guide off with a bang, taking a look at a helmet that is the epitome of what you picture when you think of motorcycle helmets. 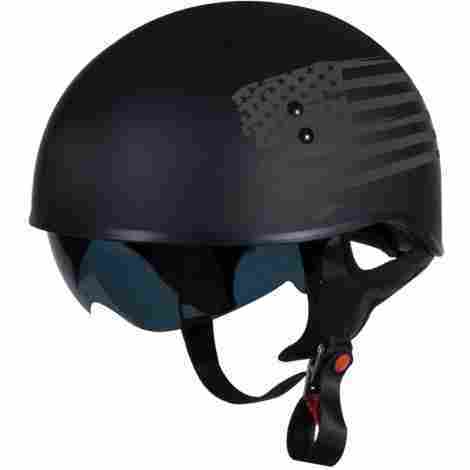 HJC put a lot of thought and effort into producing a fine example of blending form and function, producing a helmet that is the ideal piece for riders of all styles and skill levels. This is a very sleek, affordable choice that performs well enough to place it right up there near the top of the pile. One of the best features of this helmet is easily the smoky tinted visor that covers your face. Not only does it look seriously sharp and hides your face from prying eyes, it also keeps that nasty sun out of your eyes. From the blinding glare to the harmful rays, everything stays out where it belongs, leaving you free to concentrate on the road. Most motorcycle helmets are inherently easy to clean, at least on the outside. All you need is a little soap, a good scrub, and you’re done. The inside can be a different story entirely. This time though, the manufacturers made everything on the inside of this helmet easy to get out, you can get in there and clean up. The lining is washable too, so everything can be good as new all the time. 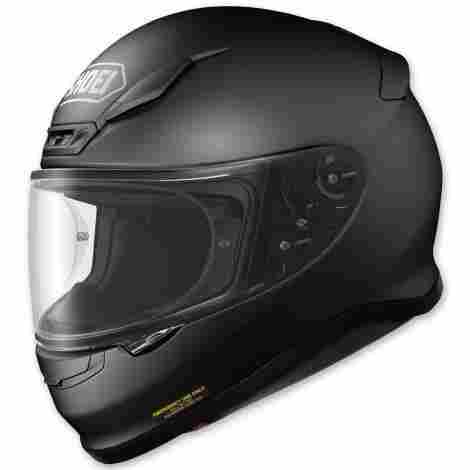 If you were to take the prices of the different types of motorcycle helmets on the market and average them out, what you would get is this helmet. It falls pretty much right in the middle of the pack as far as cost is concerned, but luckily soars to the top when it comes to safety and performance. This one is cool. It looks like a futuristic pilot’s helmet with all the features on it. It’s a modulator model, so if you really want, you can keep everything out in the open and enjoy the air on your face, or, you can cover up and shut out any possible distractions. The best part about keeping it open is that you still have protection from the sun. That’s right, this baby has a dual lens system, with the full face shield being clear, while the inner sunglass style pair is tinted for convenience. There are a few helmets on the market with a similar set of visors, but few do it as well as this one does. This goes back in part to the helmet having so many options since you can use them both, or just the clear outer shield, or even just the tinted ones for a bit of shade. Or, if you’d rather have none at all, flip them both up and just ride. If there was one word to describe this helmet to a tee, it would have to be variety. I say that because everything about it gives you choices. It starts when you first buy it with an array of colors and visors to choose from. Once you get it home and start using it, then you get the choice of shutting the world out or flipping up the face shield and letting the breeze in. Any way you want to ride, this one has you covered. 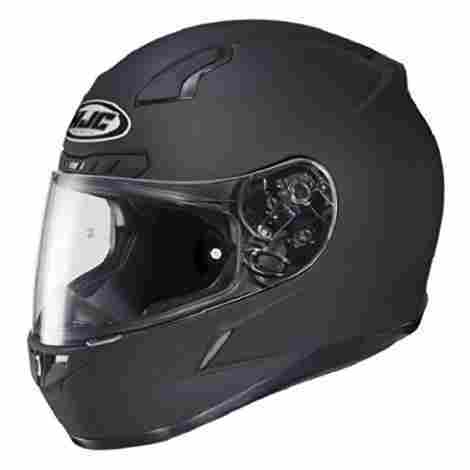 Absolutely one of the most affordable choices available on this list, this is a full face modular helmet that has the price point of some of the more basic half or three-quarter helmets. With all of the features included here, the value of this helmet just skyrocketed. This helmet screams 80’s indulgence and decadence, and in this case, it’s a very good thing. This is a street cruiser’s dream, with a full face shield and venting to that promises proper airflow. It boasts a very minimal aesthetic with very clean lines and smooth curves and is sure to get you noticed around every turn. Also, it’s made by Bell, so you’ll be able to see the exceedingly high level of quality everywhere you look. I’m not kidding when I say that I think you could wear this helmet around the house and not notice it. The exterior might be built for safety, but inside, it’s all about making you feel good as you slip it over your head and experience a level of comfort that you would never expect. Full range of motion is one thing that this helmet both boasts, and provides. Most riders would shy away from buying a full face mask helmet because of they just don’t think that they’ll be able to see as well as they should. Well, this helmet has a very wide opening, providing the same peripheral vision you would have if you were wearing nothing on your head at all. This is a full-face helmet, and it’s made by a renowned manufacturer with decades of quality under their belt, so guess what? It’s expensive. However, it’s still a great helmet made by Bell, so for what you get, it’s incredibly affordable with a value that can’t be denied. Another full face helmet makes its way onto the list yet again. As open-ended as this list purports to be, these helmets are going to pop up more often than not because of the extra features present in their build. This one is the first LS2 offering to show up in this buying guide, and it’s going to be tough to equal its level of quality. Opting for a completely modern design, the manufacturers have put together a helmet that is the ideal piece to complete your setup. The quick release chin strap meets DOT standards and makes securing the helmet snugly to your head a simple matter. This is very important since for a helmet to really protect, it needs to fit as well as it possibly can. Having adequate protection for riding your bike is an expensive proposition, but a very necessary one. So any time that you can get yourself such a key piece for much less than it typically goes for, you’re left with a real feeling of satisfaction. The value provided here lends peace of mind that you can’t find just anywhere. This is a full-face helmet that is going to seem like an absolute bargain when you first look at the low price tag, but this one is far from being a low-end bargain helmet. It’s built well enough to hang with the big boys right up at the top of the list, full of high-end features and uncompromised construction. This helmet screams old-school cool, yet comes packed with all of the most modern and cutting-edge safety features that help make it a very safe and reliable option. Plus, it’s an open-face ¾ model, so if you happen to be looking for something that protects you but doesn’t cover up your face, this is as good a choice as any. Add on the included visor and you can ride in style while still being able to see everything in front of you. Alternatively, if you need to add a bit of warmth and don’t want to spend the extra fortune on a new helmet, Core made an optional balaclava to keep you going on those cold days. The US Department of Transportation makes it necessary that any helmet available for purchase has to follow DOT Safety Standards before it can be released for sale, in order to ensure the safety of riders across the country. This helmet exceeds their standards and all but ensures that you’ll be well guarded while on the road. Because motorcycles aren’t always taken as seriously as other motor vehicles, some companies don’t always give biker gear the attention it deserves. Instead, Core decided to cover the entire exterior of this helmet with an automotive grade paint, giving it plenty of extra durability and scratch resistance. While on the road, even a scratch can compromise the integrity of the helmet, so going this far above and beyond is very reassuring that you made the right decision to buy it. All helmets need to meet DOT standards before they can be sold, yet who knew that you could find an approved helmet that was so affordable. This offers safety and style while being incredibly low-priced, and its stylish appearance will make onlookers think you paid way more. When I first looked at this helmet, I immediately thought of an urban rider, one that commutes everywhere on their trusted metal steed. That’s the image that always comes up when I see the Shoei name, along with the impression of absolute high-end quality. They’ve been around for a long time, and given their reputation, are not likely to go anywhere anytime soon. This particular part of their line is lightweight, attractive, and functional, making it the go-to for motorcycle enthusiasts everywhere. Shoei wanted to ensure that airflow was at its highest level, so there are vents everywhere on this helmet. As an added bonus, all that air is going to keep the chances of the lenses fogging up to a minimum, which is definitely a breath of fresh air. The interior lining of this helmet just does so much. For one, it fits the shape of the rider’s head, improving protection and maximizing comfort. After that, the interior as a whole, and specifically the lining, all combine to prevent moisture from forming inside the helmet. A lot of other companies view the interior as an afterthought, but Shoei sees it as the first line of defense. Shoei is a company that knows how to make excellent protective gear for riders, and they also know their own worth. They put a lot into their products, using top quality materials to come up with items that anybody would be proud to own and use. So while you will pay more for their stuff, you’ll be getting your money’s worth. Finally, we’re getting somewhere, and instead of yet another full face selection, we’ve got ourselves a ¾ quarter helmet, with much of the same coverage, while giving a lot of the same freedom of a half helmet. They have more protection, but won’t hinder your line of sight at all, and are a great choice for bikers of every level, though many beginners tend to go with a helmet with more protection. For those who want a bit more freedom, though, Torc has made the perfect piece. The lining is faux suede, making your comfort one of the main points of focus during your ride. True, it’s not real suede, but cost wise that’s a better choice, and in terms of comfort and feel, it all feels the same. If you’re worried about how it looks, who’s going to notice? All of the helmets in this line boast a different decal, all of which add a bit of a custom touch to your biking ensemble. Regardless of which one you choose, style-wise you’ll be in good hands. It has a strong finish as well, making sure that graphic isn’t going anywhere. 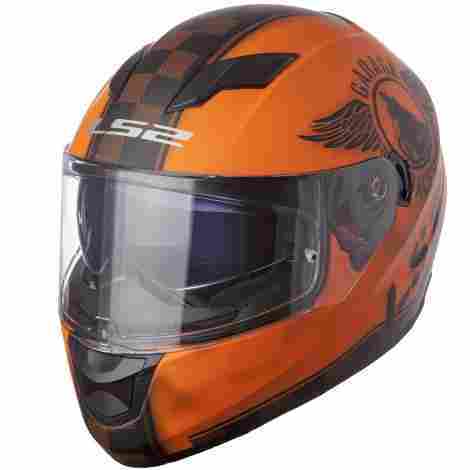 This helmet offers all of the protection of a full-face version, but cost a lot less than most other helmets of a comparable design. This all adds up to a tremendous value for your hard-earned money, letting you ride in style the way you deserve to. Fits true and holds snug, allowing for prolonged use. When you hear the term Spec ops, you think high tech, military grade equipment. In this case, you are close to being right. It’s not specifically made to military specifications, but try it put a few times and you’ll see that the strength and durability it contains would certainly make the grade. This is a simple, clean-looking helmet that is as no-nonsense as they come. That means that it was built to do its job, and not get in the way. That’s it. This helmet does just that, and it does it so well. When you first pick this helmet up, you’re likely to notice the solid, hefty feeling that it gives off. Everything here is about attention to detail, and the solid construction will help to assure you that you are in good hands every time you slide this helmet over your face. When it comes to riding, you do it for the love of the ride, and this piece gives you the peace of mind to enjoy every moment of it. The main perks of this helmet are the low profile and lightweight construction. This all adds up to an experience that can leave you wondering if you forgot to even bring your helmet along. The less you notice it, the longer you can be on the road in comfort. This helmet lines up with the majority of other skull caps when it comes to pricing. What that means is that it won’t cost you very much at all while providing you with a wealth of features designed to give you the maximum amount of comfort and safety. You’ll walk away feeling like you made a good purchase, and that’s because you did. The second offering from LS2 on this list is a classic example of what a half helmet should be. Very low-profile and unassuming, riders flock to it because they crave the freedom of not wearing a helmet, but still, want a chance at survival if they ever have a crash. Add on the include neck skirt and visor peak, and you have yourself a completely unassuming piece of gear that offers top-notch protection and unmatched aesthetics. The very forgiving price point doesn’t hurt at all, either. If you take a look at the majority of helmets on the market today, most of them are made from a plastic of some type. LS2 chose to use fiberglass, which has very good impact resistance and will go a long way toward keeping your head as safe as it can possibly be in case you get into a crash. A lot of helmets come with an included visor to keep out the sun, but LS2 went the extra mile by also throwing in a zippered neck skirt, which keeps the cold air out, and your neck and head toasty warm. Not many people like to ride their bikes when winter begins to arrive, but for those brave enough to keep going, this helmet offers everything they could want. This helmet is the most cost-effective half-helmet on this list and is tied for the lowest priced helmet in general. This by itself isn’t enough to determine its value, but after you've admired the minimal approach to the design, it starts to all become perfectly clear just how substantial that value really is. Last up, a very high-quality helmet with an even better price point. I wanted to end off this list with the most accessible offering I could find that still managed to rank at or near the top of best of lists everywhere. While the low price will often be the major selling point, that’s okay. It gets people in the door, then lets the superior build and wealth of features do the rest of the work. Vega put a lot of work into this helmet, and it shows. Way too many motorcycle helmets only come in a few sizes. These are usually small, medium, and large. While this does cover the majority of heads, it still leaves quite a few without options. Vega decided to go above and beyond, giving riders a helmet for every head size and shape. Making the inner liner from an anti-microbial fabric takes care of two issues, first, this will kill off any bacteria that may be harmful to the rider. Second, most of the unpleasant smells associated with any personal gear come from microbes, so eliminating them is going to take care of the odor issue. Like I stated when I introduced this selection, this helmet is incredibly accessible to rides of all levels and incomes. It has most of the features more high-end versions offer but still manages to come in at a much more reasonable price. This fact alone would guarantee value, but it’ all the obvious attention to detail that helps to push it over the edge. See what I mean about there being a lot to choose from? There’s just so much. 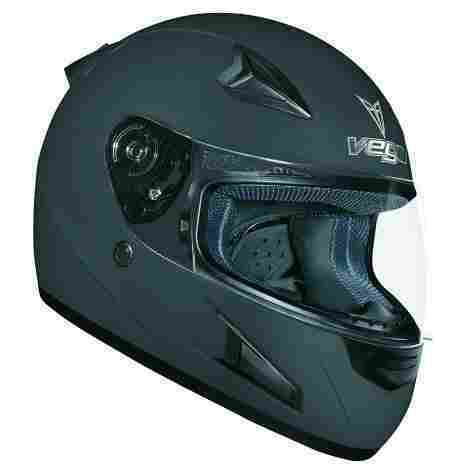 Hopefully, this buying guide will be able to fulfill its purpose and help point you in the right direction on your path to finding the best possible helmet for your needs. In terms of your safety and protection, I can’t stress enough that all of these choices are going to do an admirable job. They have all passed the same certification standards before they were even allowed to be put on the market. That being said, the rest is up to you. You’ll need to do your research and figure out which of the wide range of available features are going to suit you best. When you’re out there on the road, your life is in the hands of your protective gear, so it only makes sense to be fully aware of what each piece is going to do for you. 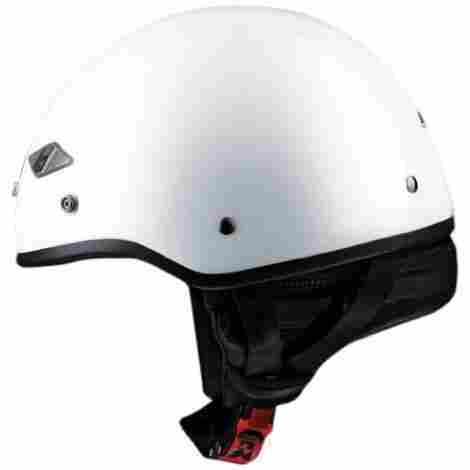 Even though there are a lot of different options to choose from when selecting the ideal helmet, they all fall under five main styles: the full face helmet, off-road helmets, modular helmets, open face helmets, and half helmets. All of these perform a similar purpose in keeping the rider safe while on the road, but they each perform this task in a different way, designed to suit the particular needs and desires of the individual. The full-face helmet is one that does the most. Encompassing the entire head and face area, these helmets offer complete protection from impacts, especially if the rider chooses to add a face shield to completely cover the opening in the face. They fully isolate the rider from the noises and distractions of the road, allowing them to instead focus solely on the task at hand. These helmets are ideal for the type of rider that appreciates the destination over the journey or are single-minded in their approach to riding. Off-road helmets are generally more simplistic in nature, requiring far less in the way of features in order to accomplish its job. These are full-face helmets that focus more on durability and toughness in order to hold up better to the increased abuse that off-road riding can cause. Used largely in remote areas such as deserts, forests, mountains, and everywhere in between, these helmets need to withstand the elements while at the same time keeping the rider safe, dry, and comfortable. They often include vents for airflow but are pretty minimal in terms of visors or other, more superfluous features. An interesting hybrid of open-face and full-face helmets, the modular helmet is a full-face helmet, at least in function. While riding, they are intended to fully cover the face of the motorcyclist, but can instantly flip up to become open-faced while the bike is at a stop, to allow the rider to get some fresh air, or give easy access to the face. It was originally believed that these helmets were created for smokers, but this has since been debunked. Many of these helmets offer a second visor that is tinted in order to increase comfort and convenience for the rider. Open-face helmets are the perfect choice for riders that want as much exposure to the elements as possible while still maintaining a higher level of safety and protection. They aren’t perfect, since they don’t protect from rain, bugs, or other annoyances, nor do they offer as much protection as a full-face model. However, the rider who chooses this style should know what the drawbacks are. Also, they are a safer choice than a half-helmet as they cover the back and sides of the skull down to the base of the neck. For added protection from the elements, riders can add a flip-down visor to keep particles and debris away from the eyes. The final type of helmet is the half-helmet or the skull cap as it is also known. These ones offer the most basic protection against accidents, covering just the top of the skull down to the brow. They do not cover the ears or face at all and are the go-to choice for riders who want the full riding experience. They are also considered open-face helmets, but don’t allow for a visor, or much else in the way of added peripherals. Half helmets also have the added bonus of not impairing vision at all, though for many people the trade-off isn’t worth the reduced face coverage. The overall cost of a motorcycle helmet really comes down to a few key factors. These are: who the manufacturer is, what type of helmet it is, and the number of safety and comfort features it has. The overall safety level of the helmet really has no bearing on cost, since all helmets need to meet or exceed DOT standards before they can be considered safe for use by the public. In the world of motorcycle helmets, there are dozens of manufacturers who offer their products to the buying public, yet a few stand out as constantly reliable and are seen as the go-to brands. Maybe it’s because they have a reputation for putting together high-quality products using only the top of the line materials, or even that their level of customer service and attention to detail are unmatched by just about everybody else. Whatever the case, these brands could most likely sell products based on their name alone. Unfortunately, some choose to do this, and as their name grows, they take cost-cutting measures to increase profits while reducing costs. The inevitable end result of this is an inferior product that the consumer buys because they trust the brand. The best companies strike a balance between high quality and value, giving consumers as much bang for their buck as possible, no matter how much they need to charge. The type of helmet, surprisingly, doesn’t affect the cost all that much. Obviously, a full-face helmet is going to cost more than a skull cap, but not by much, barring any additional features and add-ons. As far as the base helmet goes, there is not a significant increase, but once you consider that full-face models have greater requirements in order to function properly, that will drive the price up. The biggest requirements are a venting system for airflow, and, in some cases, at least one visor to cover any exposed areas of the face. Now lastly, the number of features that the helmet has will affect the price. Again, since full-face helmets need to do more than half-helmets, they are inherently going to have more to them, and therefore cost more. These are all mostly necessary, such as visors and venting, though some are less than critical, like integrated Bluetooth capability. For the other styles, most of the features are going to be cosmetic, and will rarely affect the performance of the helmet. More often recently, riders have been going to a more minimalist design for their helmets, not requiring many add-ons to make their ride complete. Not only are these ones very efficient, but they are cost-effective as well. For this criterion, there are two categories of features that I’m going to take into account: features that affect performance, and those that are strictly cosmetic. Both are found predominantly on all types and styles of helmet, though the smaller models will tend to have less that are actually functional. Despite the fact that all helmets need to be equally as safe across the board, many companies will opt to include additional perks that work to improve the level of protection and functionality. 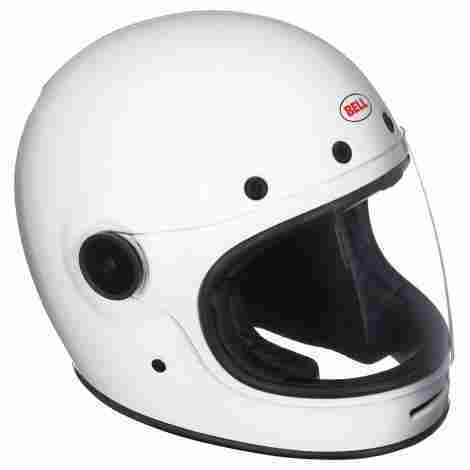 The type of helmet that these features show up on the most are the ones that offer more coverage, such as the full-face or ¾ face models. These ones have more features because they offer a different range of performance by design. These features will include a venting system to both increase airflow and keep the rider dry, anti-microbial liners that keep out bacteria for an odor-free ride, and one or more flip down visors that are either clear or tinted. Clearly, these features won’t have much of a direct impact on the level of safety and protection offered by the helmet but instead will work to support those functions by increasing comfort and removing unwanted annoyances. The vents are probably the most important, as overheating while wearing a full-face helmet is a real concern that can affect the health of the rider. 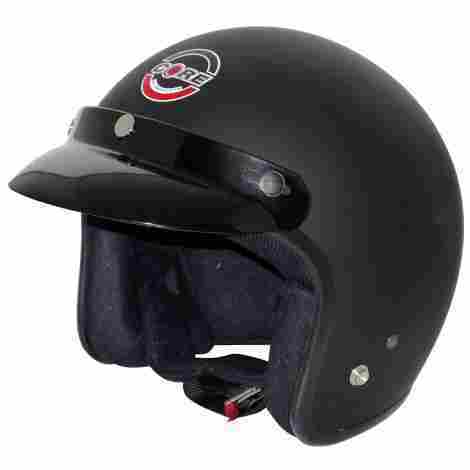 The other features available are mostly aesthetic in nature and can be found in virtually every type and style of helmet. This can be everything from custom graphics, a Bluetooth speaker system, or even a removal neck skirt. One feature, found mainly on skull caps and other smaller helmets, straddles the line between visual appeal and functionality. Since these smaller helmets can’t easily include a face shield or visor, manufacturers have added what’s known as a peak that affixes over the eye line. These add a unique look to the helmet, and while their function isn’t crucial necessarily, the ability to keep the sun out of your eyes without having to resort to sunglasses or some other means is a useful option to have. As I’ve stated above, there has been a bit of a movement of late away from feature-laden helmets, with riders instead choosing a simpler, minimalist design with clean lines and generous curves. Because these helmets are more streamlined, manufacturers can then focus on their product being more single-minded in their purpose, in turn making them more efficient and practical, as wells as reducing the cost to the consumer. Closed-head injury: This is a type of traumatic brain injury where the skull still remains intact. They are a leading cause of death and physical disability for young people. They are also a primary cause of cognitive impairment. Common closed head injuries include concussions, intracranial hematoma, and cerebral contusions. DOT: The US Department of Transportation. They are the governing body responsible for the well-being of motorists on roadways and waterways. Their Standards ensure that any automotive safety equipment must meet their certifications in order to be permitted for sale to the public. ECE standards: The European equivalent of the American DOT standards. The ECE stands for Economic Commission for Europe. It was created under a United Nations agreement in 1958 to create a universal standard of helmet regulations for a number of different countries. Currently, the standard is accepted in 47 countries throughout Europe. EPS: Expanded Polystyrene foam. This is a cellular plastic found in a wide variety of shapes and is used between the interior lining and outer shells of the helmet. It is extremely lightweight, yet has a superior ability to absorb impacts, making an ideal choice for a multitude of safety equipment. Face Shield: A covering that sits over the front of the helmet that protects the wearer from debris or flying objects. They can either be made clear to allow full visibility or slightly tinted in order to provide protection from the sun’s rays. Despite the darkened shade, tinted visors retain a high level of visibility for the rider. Full-face helmet: As the name implies, the full-face helmet is one that covers the entire area of the head, from the base of the skull to the chin and jawline. They have a cut out opening across the eyes and nose, but these can easily be covered with a face shield to help protect those exposed parts. While these helmets do increase heat, many have venting systems to help alleviate this issue. Some riders don’t like the isolation they feel in a full face helmet, but others prefer it because it lets them block out any distractions. Half helmet: Half helmets are seen as an ideal compromise for those who don’t particularly enjoy the feeling of wearing a helmet while operating a motorcycle. It covers the entire top of the skull up to the eye line of the rider. They don’t protect the face but are a popular option due to their not being restrictive. Also, measures can be taken to protect the face from the elements as well as the hazards of the road. Inner liner: Materials that are used to line the interior of the helmet while serving several purposes. They offer increased protection for the head in the event of an accident, helping to keep the skull from bouncing around and being damaged. Inner liners also help keep the wearer dry by absorbing moisture and transferring it away. Finally, they help increase comfort by acting as padding against the hard shell of the helmet. Modular helmet: This style of helmet is known as a hybrid of open-faced and full-face helmets, offering up the best elements of both. 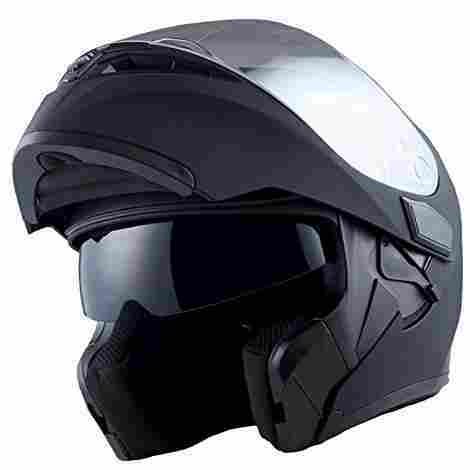 The face shield can be easily flipped up to convert the helmet to an open-face model, allowing the rider to get some fresh air while taking short breaks. Open face: This helmet leaves the face open, and can include almost any style of helmet, from three quarter to full helmets. Half helmets are not technically considered to be an open face helmet because it doesn’t cover any part of the head below the brow. Q: Where did motorcycle helmets come from? A: The origins of motorcycle helmets have been traced to race tracks in 1914. Dr. Eric Garner was noticed a large number of head injury cases in riders, so he had stiff canvas and shellac helmets built to withstand a heavy blow and redirect the energy from impacts. They were originally used primarily on racetracks, where they were first made mandatory. A: It took a long while to make helmet use mandatory, and unfortunately, there are still some areas where they are not required. In the US, 19 states have mandatory requirements, with 28 states having provisional laws. That leaves three US states with no helmet laws whatsoever. Aside from the legal ramifications, all rider should wear a helmet anytime they get on a bike, as helmets significantly increase the likelihood of not sustaining any injuries. Q: What makes motorcycle helmets different from other helmets? A: Most helmets produced today are very similar in construction, though motorcycle helmets are more geared toward withstanding impacts and abrasions from coming in to contact with the pavement. Q: Is a full-face helmet better than a half helmet? A: That all depends on what you want to get out of the ride. In terms of safety, they are pretty similar, except that half helmets don’t protect the face and jawline nearly as well. Impact to the skull though doesn’t change between the two types. Otherwise, it comes down to preference. Half helmets are as close to not having a helmet that you’re going to get, leaving your face fully free and exposed to the wind and other elements. Full-face helmets, on the other hand, leave the entire head covered, and can be combined with a visor to completely isolate the rider from the outside world. Some riders dislike the isolation, while others swear by it, citing the increased focus that it brings. Q: What are helmets made from? A: Helmets are constructed from several different materials. To be more specific though, most helmets are comprised of two main components: the hard outer shell and the softer inner layer. The outer shell needs to be very rigid and durable and is typically made from a polycarbonate plastic, which is known for its strength and versatility. The inner layer, however, needs to be softer as it is meant to directly protect the head of the rider. These are made from EPS or Expanded Polystyrene foam. Motorcycle Manic – Full Face vs Open Face Helmets – Which Is The Best? Quo – How does a motorcycle helmet work? Stack Exchange – Why don’t cyclists wear all-encompassing motorcycle-style helmets?